FINALLY – a return to the core values of the BMW M3. The right size, the right power, the right balance, and the right weight. Only it’s not an M3 or M4, it’s an M2. Returning to the same general size as the beloved E46 M3 – and to a far more reasonable price than the current M3/M4. Add in the Brembo brakes that the last few M3s have been missing, stick with the 6 cylinder, and we have perfection at last. • M TwinPower Turbo Technology yielding impressive performance. • Wider track featuring lightweight aluminum suspension. • Manual gearbox with innovative rev-matching technology. • Fully variable Active M Differential. • Nürburgring tested M compound high performance brakes. Woodcliff Lake, N.J.: October 13, 2015 6:01 pm EDT / 3:01 pm PDT … Today, BMW M GmbH unveiled the newest member of its product family. The coveted M badge has been placed on the popular BMW 2 Series in the form of the all-new 2016 BMW M2. 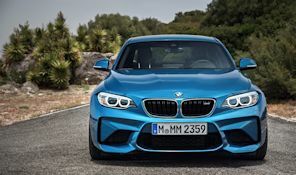 The 6-cylinder under the hood is in keeping with the finest M tradition, ensuring unbeatable driving dynamics on the trace track with exceptional power delivery and the signature, outstanding driving behavior thanks to rear-wheel drive agility and lightweight aluminum M Sport suspension. The innovative M TwinPower Turbo technology ensures outstanding torque available across a wide rev band with rapid responses and excellent efficiency, raising the pulse with its distinctive engine soundtrack.